You can find below the best cruise deals hand picked by our dealhunting editors, like the very exclusive British Isles cruise with Windstar for $1,799 per person. 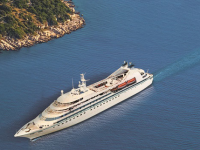 Book this 7 nights luxury cruise and sail from London to Dublin aboard Windstar’s Star Legend. Take a look at the other cruise deals as well and maybe book the 5 nights Pacific Coastal cruise starting from Vancouver from $419 per person, 3 nights Bahamas cruise in the Winter with Royal Caribbean from $164 pp or 7 nights Caribbean cruises with Norwegian with extras and updates from $229 pp. Hurry up, the best cabins will sell out first! Depart on this ldyllic British Isles cruise on June 19 2015 from London and stop at the ports of Falmouth – England, Isles of Scilly – England, Pembroke (Fishguard) – Wales, Waterford – Ireland and Holyhead – Wales before it disembarks in Dublin (Dun Laoghaire) 7 days later, on June 26. Note that you will also spend one full day at sea. Apart from visiting beautiful sights you can also participate in a complimentary Windstar private event: an afternoon at the beautiful Picton Castle in Fishguard. Note that you will need a London airfare as your Windstar cruise will start from the UK capital, but it will disembark in Dublin, so you will probably need a multi-city flight. Do not book the deal featured in this pose before you would check the box for similar cruise deals. Compare the prices of some providers and you may find a better deal. This entry was posted on Tuesday, December 16th, 2014 at 6:23 am and is filed under Cruise Deals, Top Deals. You can follow any responses to this entry through the RSS 2.0 feed. You can leave a response, or trackback from your own site.